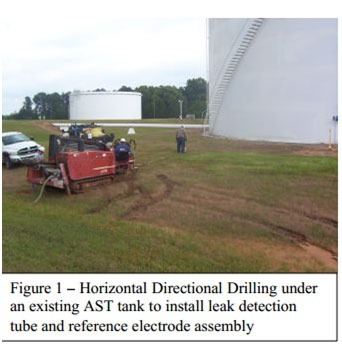 This technical bulletin addresses the design and installation of retrofit cathodic protection systems for existing above ground storage tanks (AST’s). Cathodic protection (CP) is typically applied to all above ground storage tanks built on a ring wall foundation to protect the external tank bottom in contact with the soil/sand foundation. Smaller tanks built on concrete slab foundations typically do not have cathodic protection applied to them. MATCOR typically recommends the use of fixed reference cells and linear anodes installed directly below the tank using horizontal directional drilling. 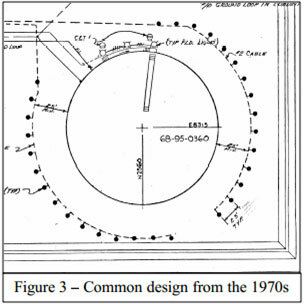 An alternate design is to use deep well anode systems to protect one or more tanks in conjunction with the installation of fixed reference electrodes under a representative number of tanks for testing purposes.In the case of a second bottom being installed, low profile linear anodes in a concentric ring pattern located between the original tank bottom and the new tank bottom are recommended. Historically, various configurations of galvanic anodes, including discreet anodes and ribbon type anodes, have been used to protect AST bottoms. Experience has shown that these systems do not provide the uniform current distribution necessary over the entire CP system design life and result in premature failure as the galvanic anodes consume. AST’s require significant current, which generally precludes the use of galvanic anodes. Almost all AST CP systems today are designed with impressed current systems to provide the current required over a long period of time. Typically tank bottoms are bare plate steel, but in some cases the plate steel may be coated on the bottom, which reduces the current required for cathodic protection. Coated bottom tanks still benefit from cathodic protection. 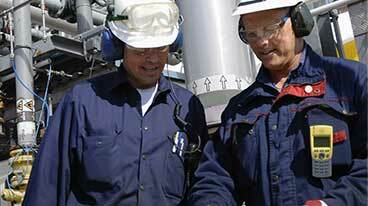 Corrosion rates increase significantly with elevated temperature, necessitating more current. MATCOR uses the following temperature correction formula for its CP designs for heated tank bottoms – for every 10° C above 30° C the current requirement increases 25%. Area Classification Rectifiers and junction boxes must be designed with suitable enclosures for the area classification where they will be installed. Often, these can be located in non-classified areas with minimal additional cost of cable while saving significantly on the cost of the enclosures and classified components. If polyethylene or other such plastic liners are placed underneath the tank, these liners act as a barrier to the flow of current. The only means of retrofitting a CP system in this case would be to install anodes between the liner and the tank bottom either through the use of a false second bottom or by cutting holes in the tank bottom and inserting anodes from inside the tank. Neither of these are particularly attractive options. Some consideration may be given to the economic value of extending the design life – for MATCOR’s SPL™-FBR and GFC anodes are available with a wide range of current outputs, and the incremental anode cost to go from 30 year design life to 50 year design life is often quite nominal, with no increase in installation costs, making this a very attractive alternative. Existing above ground storage tanks present a unique challenge for retrofitting cathodic protection – how do you test them properly? When installing new tanks, the standard industry practice is to install reference electrodes and leak detection monitoring tubes approximately 4-6 inches from the tank bottom before the final layer of sand cover is placed. The reference electrodes are necessary so that the CP system can be tested to assure that the entire tank bottom is being properly protected and to adjust the system output for optimum operation. Retrofit projects, however, are not so simple. The challenge with retrofit installations is that it is not possible to test the potential of the tank, except at the periphery,without having some sort of reference electrode directly under he tank. Standard industry practice is to use horizontal directional drilling (HDD) to install leak detection and fixed reference electrode assemblies under the tank.The leak detection and monitoring tubes consist of slotted or drilled/perforated PVC tubes with reference cell assemblies that can be pulled under the tank. For small diameter tanks (less than 20 ft), testing around the perimeter of the tank is sufficient and it is not necessary to stall reference electrodes directly under the tank to assure proper cathodic protection, but we cannot recommend that for larger tanks prone to poor current distribution. If you cannot test the CP system’s performance there is no reason to have a system. MATCOR strongly recommends the installation of monitoring tubes and reference electrodes under the tank using HDD. This is a common industry practice and provides the only means of assuring that the CP system is providing thorough coverage across the entire tank profile. When installed in conjunction with fixed reference electrodes and leak detection monitoring tubes, linear anodes placed directly beneath the tank bottom provide the highest degree of design certainty. With the anodes directly below the tank bottom, stray current concerns are minimized and thorough current distribution across the entire tank bottom is assured. 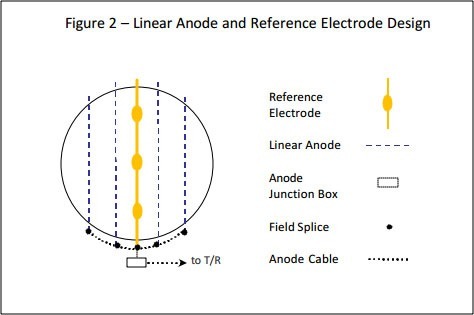 Figure 2 shows a typical layout for a linear anode system retrofit application. One tempting design approach to retrofit AST bottom CP is to install a shallow distributed point anode system around the periphery of the tank. These are typically augured in to depths of 5-10 feet. Figure 3 shows a common design typical of how these systems are implemented. Unfortunately, these shallow distributed anodes often fail to provide sufficient current to the center of the tank. 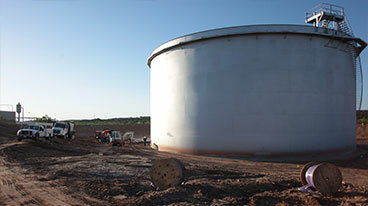 Above ground storage tank bottoms are large bare surfaces requiring a great deal of current. To assure that current distributes properly, the anode depth and distance from the tank are critical. Shallow peripheral anodes are not able to throw current to the center of all but the smallest of AST’s. MATCOR generally does not recommend shallow peripherally distributed anodes for AST’s with tank diameters exceeding 20 ft (6 m) due to the quantity of anodes required and the risk of poor current distribution to the center of the tank. Placing deep well anode systems well below the tank bottom to provide current uniformly to the tank bottom are another option to protect AST’s. This approach has some limitations in heavily congested plant environments where current can flow to other buried structures. When multiple deep wells are employed to protect more than one tank in a cluster, care must be taken to assure proper current distribution. Should the existing tank utilize a containment liner that shields current (i.e. polyethyleneliner), the deep well cannot be used. MATCOR typically recommends annual testing/inspection of the tank bottom cathodic protection system by a qualified NACE CP level 1 or higher technician familiar with testing CP systems for AST’s. As with any impressed current system, monthly rectifier checks should be performed by plant maintenance to assure that the rectifier is on and that the voltage and current outputs remain stable.